Badges were designed primarily for the purpose of personal identification. They consisted of standard medallions finished in gold, silver, or bronze, with ribbons attached. Each medallion had an inscription such as "I.O.C. ","Official", "Press", etc. 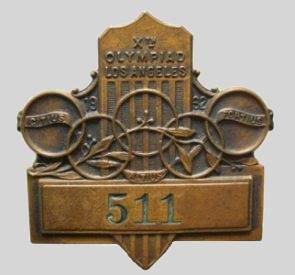 Badges for all Olympic officials were made with the medallion at the top, with the ribbon suspended, and were easily distinguished from the badges of the Executive Staff, which were designed with the medallions suspended on the ribbon. Badges with gold medallions were issued to all members of the International Olympic Committee and the Organizing Committee, and to the presidents of the National Committees and the presidents of the International Sports Federations; badges with silver medallions were issued to secretaries and members of National Committees, secretaries of International Sports Federations, Juries, AttachÈs, and Chefs de Mission; and badges with bronze medallions were issued to Team Managers, Athletes and attendants, and to the Press. The color of ribbon in each case identified the organization or the sport. While the above system clearly identified the wearers, an additional Olympic ribbon was created, bearing the five Olympic colors in vertical stripes, and this ribbon, when attached to a badge, entitled the wearer to special privileges and courtesies including admission to the Olympic Village. Badges with the Olympic ribbon were issued to members of the International Olympic Committee and of the Organizing Committee, to officers and members of National Olympic Committees, officers of International Federations, and Attachès. The identifying ribbons on all Jury Badges were the same color as that selected for the Sports Federation they were to serve. Therefore, to identify officials or juries of any sport, it was only necessary to watch for the standard medallion with the identifying ribbon for that sport attached. If the badge also had an Olympic ribbon with a gold medallion, the wearer was the president of the Federation. If the badge had an Olympic ribbon with a silver medallion, the wearer was the secretary of the Federation. Or if the badge consisted of merely the medallion with the plain piece of identifying ribbon, the wearer was a member of the jury of that sport. None of the badges issued to the International Olympic Committee, National Olympic Committees, International Sports Federations, Organizing Committee, Juries, AttachÈs or Press were good for admittance at the gates of any of the stadiums, all persons to whom these badges were issued being also given regular tickets of admission. The badges issued to Chefs de Mission, Team Managers, Coaches and Attendants, and to the Athletes were good for admittance at all places the wearers were entitled to go, including the Olympic Village. These badges were all serially numbered on the medallions and were easily distinguished. Badges of the Chefs de Mission and Team Managers bore a short piece of dark blue ribbon. They entitled the wearers to enter the dressing rooms and the athlete sections in the stands at all stadiums. Each athleteís badge had a short piece of the colored ribbon attached, indicating the sport in which the athlete was a competitor. As provided by the Protocol, these badges were good for admission to the athletesí section in the Olympic Stadium and to the athletesí section and the training quarters at the stadium at which the athlete was participating. Th us all athletes were admitted to the athletesí section in Olympic Stadium but only competitors in the swimming contests, for instance, were admitted to the athletesí section in the Swimming Stadium, and only boxing contestants were admitted to the athletesí section in the Boxing Stadium. Badges for the Executive Staff of the Organizing Committee consisted of a piece of Olympic ribbon from which the medallion was suspended, the individualís name or the word ìManagerî appearing on the medallion. These badges were good for admittance at all places at all times and were an indispensable convenience. Persons wearing badges with their individual names printed on the medallion were entitled to issue instructions to the staff at any stadium and staff members were bound to carry out these instructions. However, the staff members were obliged to remember the name of the person giving the instructions. Staff badges for executives in charge of the various stadiums were made with the medallion suspended on a ribbon the color of which identified the stadium. These were good only at the one stadium. The staff title of the wearer, such as "Manager", or "Sports Technical," was imprinted on the medallion.